High-performance mainstream 2-socket 2U rack server: high capacity storage, reliable and scalable, boosts workload efficiency for mission critical applications. Dell R730xd rack server features 24 DIMM slots, memory expandable up to 1.5 TB. Supports 3.5-inch HDDs (accessible from the front), two 2.5-inch SSD and E5-2600 v3 Series, capacity for up to 28 drives. 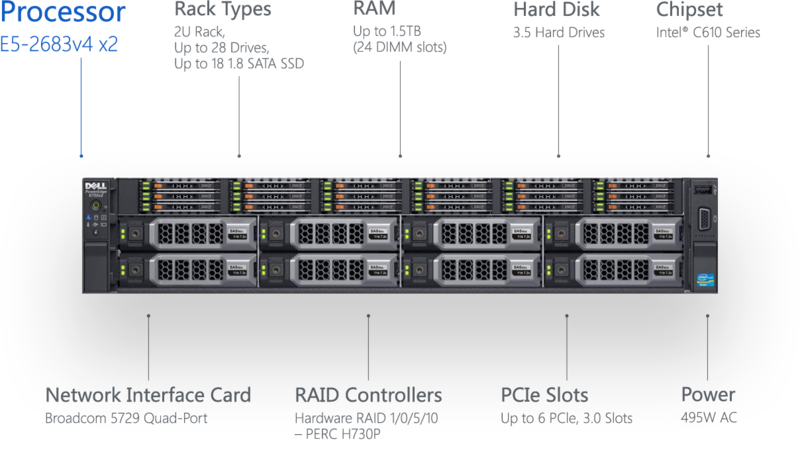 Features multiple RAID controllers with twice the storage bandwidth of previous generations. Compatible with software defined storage (SDS) solutions, includes dual internal SD cards to support a redundant boot device for VMware ESXi and PERC H730P controller (supports transfer rates up to 12Gbps). In case of failure, a system fault will trigger allowing the administrator to issue an orderly shutdown for repair. Dell PowerEdge R730xd remote management system gives you the option to monitor and manage from anywhere. Administer systems from your smartphone, notebook, or at the system itself with both local and remote management options. It is made simple through the integrated Dell Remote Access Controller (iDRAC) with Lifecycle Controller that provides time-saving management functions. Dell’s next generation Intel Xeon E5 processors (4GB memory) drive innovation and generate revenue. R730xd delivers large memory capacity, I/O bandwidth and fast response times, provides lower latency and faster response times. Using Intel’s latest Haswell DDR4 memory. PowerEdge R730xd includes Microsoft Exchange and Microsoft Storage Spaces. Total available storage can also be expanded with the additional of a Dell Storage MD1400 direct-attached storage enclosure.